MS® submerged PVDF flat sheet membranes, made of novel modified polyvinylidene fluoride (PVDF), are specialized for plate & frame membrane system, such as for Membrane Bioreactors (MBRs) technology, which deeply treat recycled water reuse and industrial water such as municipal, electricity, steel, petrochemical, textile, landfill leachate, etc. 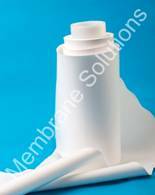 MS® PVDF flat sheet membranes have the ability to reject large macromolecules, which are useful in the separation of flat and microbes throughout the dairy industry. 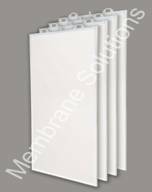 And in certain high solids wastewater applications, the PVDF flat sheet membrane provides excellent performance, longer service life and operation cost.